SEOUL, South Korea -- South Korean President Park Geun-hye says the captain and some crew members of the sunken ferry committed "unforgivable, murderous acts" in the disaster that left more than 300 people dead or missing. She made the comments Monday at a Cabinet briefing. The captain initially told passengers to stay in their rooms and waited more than half an hour to issue an evacuation order as the ferry Sewol sank Wednesday. By then, the ship had tilted so much that many of the roughly 240 people missing are believed to have been trapped inside. The confirmed death toll rose to 64 Monday. There were 476 people on the ferry when it sank, most of them students from a single high school. "The conduct of the captain and some crew members is unfathomable from the viewpoint of common sense, and it was like an act of murder that cannot and should not be tolerated," Park said. "Right after the accident, the captain did not immediately follow the evacuation orders of the Jindo Vessel Traffic Services Centre (VTS)." Park says the captain and crew "told the passengers to stay put, but they themselves became the first to escape, after deserting the passengers." She says that "legally and ethically, this is an unimaginable act." As divers increasingly made their way into the ship, including through a new entryway through the dining hall Monday, there was a big jump in the discovery of corpses. And that means that on Jindo, an island near where the ferry sank Wednesday, relatives of the missing must look at sparse details such as gender, height, hair length and clothing to see if their loved ones have been found. There are no names listed as relatives huddle around white signboards to identify bodies -- just the slimmest of clues about mostly young lives now lost. Many favored hoodies and track pants. One girl painted her fingernails red and toenails black. Another had braces on her teeth. "I'm afraid to even look at the white boards," said Lim Son-mi, 50, whose 16-year-old daughter, Park Hye-son, has not been found. "But because all the information is quite similar, whenever I look at it, my heart breaks." That's why relatives have already lined up to give DNA samples at the gymnasium where they are staying, to make bodies easier to identify when they are recovered. With hopes of rescue withered, relatives angrily confronted government officials several times Sunday, furious as what they see as an inadequate response to a disaster that may have claimed more than 300 lives. Prosecutors said Monday they had detained four crew members - two first mates, a second mate and a chief engineer - whom they suspect of failing to protect passengers. Senior prosecutor Ahn Sang-don said prosecutors will decide within 48 hours whether ask a court for arrest warrants for the newly detained crew members. 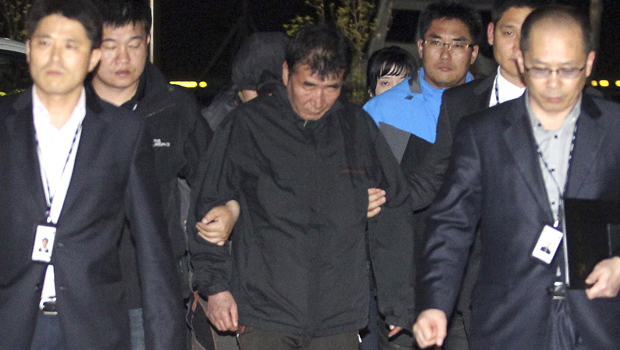 The Sewol's captain, Lee Joon-seok, 68, was arrested Saturday, along with one of the ship's three helmsmen and the 25-year-old third mate. The third mate was steering at the time of the accident, in a challenging area where she had not steered before, and the captain said he was not on the bridge at the time. "At the time, the current was very strong, the temperature of the ocean water was cold," Lee told reporters, describing his fear that passengers, even if they were wearing life jackets, could drift away "and face many other difficulties." A transcript released by the coast guard Sunday shows the ship was crippled by confusion and indecision well after it began listing Wednesday. According to the transcript, about 30 minutes after the Sewol began tilting, a crew member repeatedly asked a marine traffic controller whether passengers would be rescued if they abandoned ship off South Korea's southern coast. That followed several statements from the ship that people aboard could not move and another in which someone said it was "impossible to broadcast" instructions. An unidentified official at Jindo Vessel Traffic Services Center told the crew they should "go out and let the passengers wear life jackets and put on more clothing." "If this ferry evacuates passengers, will you be able to rescue them?" the unidentified crew member asked. "At least make them wear life rings and make them escape!" the traffic-center official responded. "If this ferry evacuates passengers, will they be rescued right away?" the crew member asked again. "Don't let them go bare - at least make them wear life rings and make them escape," the traffic official repeated. "The rescue of human lives from the Sewol ferry ... the captain should make his own decision and evacuate them. We don't know the situation very well. The captain should make the final decision and decide whether you're going to evacuate passengers or not." "I'm not talking about that," the crew member said. "I asked - if they evacuate now, can they be rescued right away?" Ahn said Monday that a number of Sewol crew members, but not the captain, took part in the conversation. A CBS News crew found crew member Oh Yong-Seok in his hospital bed Sunday and asked him about the evacuation. Oh said the boat was tilted too much to allow for an evacuation. But why wasn't an evacuation order issued earlier? Oh said he didn't know what went wrong, saying only the captain and the person at the helm know that. Oh said the day the ferry sank was a nightmare and he is just sorry he couldn't rescue more people. The cause of the disaster is not yet known, but prosecutors have said the ship made a sharp turn before it began to list. Many relatives of the missing have been staying in a gymnasium on Jindo island, but dozens of relatives have started camping out at the port there to be closer to where the search was taking place, sleeping in tents. A Buddhist monk in white robes stood facing the water and chanted in a calm monotone as several relatives stood behind him, their hands pressed together and heads bowed in prayer. At other times, anger has prevailed. Early Sunday, about 100 relatives attempted a long protest march to the presidential Blue House in Seoul, about 250 miles to the north, saying they wanted to voice their complaints to the president. They walked for about six hours before police officers in neon jackets blocked a main road. "The government is the killer," they shouted as they pushed against a police barricade. Families on Sunday also blocked the prime minister's car and cursed at and pushed the fisheries minister. "We want an answer from the person in charge about why orders are not going through and nothing is being done," said Lee Woon-geun, father of 17-year-old missing passenger Lee Jung-in. "They are clearly lying and kicking the responsibility to others." "After four or five days, the body starts to decay. When it's decayed, if you try to hold a hand, it might fall off," he said. "I miss my son. I'm really afraid I might not get to find his body."